If you are transgender and in a crisis situation, you can call the Transgender Crisis Hotline in the U.S. 877-565-8860 or in Canada 877-330-6366. The Trevor Project is another great place for help in a crisis situation. That number is 866-488-7386. As I read and gather information, I will post links to articles, books, YouTube videos and more. This is a journey for all of us as we learn about what it means to be transgender. So whether you are reading up for yourself or a loved one, I hope my words provide help and hope. One of our Ally Moms just put together a book list. Check it out. 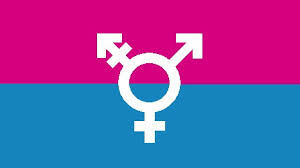 There is a story behind this symbol including the transgender flag in pink and blue…I always wondered about the colors. Here’s a link to the story. One of the key articles of clothing that transitioning FtM people need is a really good binder. In order to appear more masculine, trans* guys want to minimize the appearance of breasts. Binders can be expensive. For those fortunate enough to successfully complete top surgery, the binders are no longer needed. You can donate your binders or get one from In a Bind, a program through the TransActive Gender Center. Hello all I am a 39 year old FTM Transgendered person, My name is Justin and I most definatly prefer male pronouns. I saw your group and simply wanted to say that in this da and age it makes me smile to see such unconditionally loving parents trying their best to help educate and understand their children. If more parents took the time to listen to their kids then we would have much less young lives lost. So please know what you moms are doing here is a very good thing because wether you understand or agree with your child your doing the most important thing….Loving the precious gift the Lord gave to you. Your note made my morning. Thank you so much. I hope your journey has been fulfilling. Please share the site with others who might need support. Hi I am an 18 year old FTM transgender person who is still in high school and living with my parents and I just wanted to say bravo to you for supporting your son and the whole transgender community. I personally wish my parents were as cool as you because my parents think this is a phase for me and they have told me on multiple occasions that they don’t support me I’m this and that they refuse to let me start hormones which really agrivates me by that’s not the point I am trying to make… actually it sorta is a point but not the one I was going for. My point to this is by acknowledging the fact that your son has told you that he is transgender is amazing and that by doing that you have saved your sons life and that heis probably going to be more confident in everything that he does because he knows that you support him; which to me is the best Flippin thing a parent van do for their kid. I know from personal experience that when a kid tells you something this big it Mran they trust you to support them and if you don’t support them they will lose there confidence, they are more likely to become depressed or even suicidal depending on how much support they get from others and they will eventually shut down if they don’t feel like they are supported enough. I know I’m only 18 but within those 18 long years I have gone through hell and back multiple times and have come out victorious everytime, I had to grow up faster than most kids and I know what the lack of support can do to a childs self-esteem. The lack of support in the general population the suicide rate is 1.2% in the transgender community the suicide rate is 41%! I have almost because apart of that statistic sadly to say and it was because I felt so unsupported by my family and people around me that I almost became apart of the statistic. I can express how much you are doing for your son ans anyone else who is in the transgender community thank you from all of us. Hi my name is katelynn im not a trans but i want to be im 12 years old ive always felt this disconnection with my body for the longest time i never even heard of the word transgender until i looked up some questions i had i havent told my mom or dad anythiing about this how ever i just last night just told3 of my closest friends im scared to tell my mom and dad because i dont think they will like this what if they send me away ? i have a name picked out as i go by online in games such as minecraft csgo and garrysmod is ky when people call me a girl or she I cringe i just wanna say im a boy not a girl but im to afraid starting monday im going to start talking to the school counselor i hope all goes well but i still need help on how to tell my mom and dad can you help? I am happy to try to help and am glad that you wrote to me. My son is FtM and is almost 17. I have some questions for you. Are you in the U.S.? What makes you think you are transgender? How did your friends react? If you would prefer emailing me, feel free. It’s rozgkeith@gmail.com. Also, you can text any of the Ally Moms. Sometimes parents find it easier to understand when they hear from other parents. This blog is a good resource because they can read our story and see how we handled things. If you are in the U.S. and can tell me what state you live in I can help to find you some resources in your area. Email or reply here and I will help in whatever way I’m able. And, good for you for reaching out to find some support. I look forward to hearing from you. So I have a question- I can just text one of y’all on the list of ally moms? Like I don’t have to sign up or anything? Hi. Matt – one of our Ally Moms will respond with some support. I am Rachel. I have a FtM/GNC son and am one of the Ally Moms with StandwithTrans.org. I want to help you navigate this, but have a few questions first. Are you in the US? Do you have friends that you can lean on and that you are out to that you can get support from? If you want to talk here that is fine or you can email me at rachel_painter@yahoo.com. Or you can reach out by text to one of the Ally Moms here: https://docs.google.com/spreadsheets/d/11Oon3k2rKtoIKpE-OA8okN7RDsTosqrPYj_lO7Eme_k/edit#gid=973378882 I am all the way down on West Virginia. 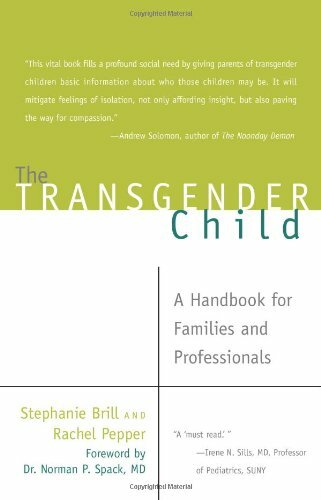 As for your dad, sometimes parents need help understanding from other parents of trans children.